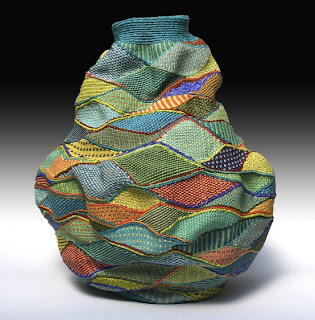 Basketmakers and fiber artists are invited to submit entries for Small Expressions, an annual international juried exhibit to showcase fiber art on a small scale sponsored by the Handweavers Guild of America, Inc. The exhibit will be on display May 31 - September 7, 2013, at Fine Line Creative Arts Center in Saint Charles, Illinois. Laura Foster Nicholson, textile artist, lecturer, teacher, and owner of LFN Textiles will serve as juror. A copy of the prospectus and poster for the call to entry is available for posting in appropriate locations. on an intimate scale that allows a special dialogue to develop. Nylon. 1-1/4 x 5-1/2 x 5-1/2 inches. 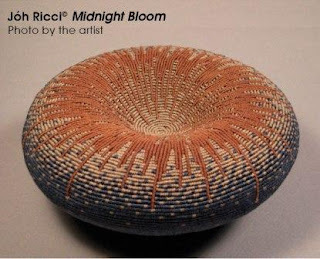 Basketmakers were well represented in the 2012 edition of this exhibit at The Long Beach Museum of Art in Long Beach, CA with awards going to Lois Russell and Jóh Ricci. 10 x 8 x 8 inches. I hope to see basketmakers prominent among entries this year as well. 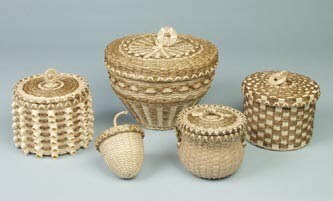 To find more information on various basketry related call to entry opportunities visit the BasketMakers Events Calendar. Be certain to scroll down the page to see information on how to subscribe to the calendars with any feed reader, ical enabled calendar program or view the listed events and call to entry opportunities in your browser. December 8, 2012 has been set for the Annual Maine Indian Basketmakers Sale and Demonstration at the Hudson Museum, Collins Center for the Arts, The University of Maine, Orono, ME. Hours: 9:00 am to 3:00 pm. This event features Maliseet, Micmac, Passamaquoddy and Penobscot Basketmakers who sell their hand-made, one of a kind, ash splint and sweet grass basketry. Work baskets, such as creels, pack and potato baskets and fancy baskets ranging from strawberry and blueberry shaped-baskets to curly bowls may be found along with quill jewelry, wood carvings and birchbark work. The event is a joint venture of the Maine Indian Basketmakers Alliance and the Hudson Museum. Those who attend the 2012 Maine Indian Basketmakers Alliance Basket Sale and Demonstration are eligible for the raffle of a 2012 Sweetgrass and Brown Ash basket by Jennifer Sapiel Neptune, Penobscot. While you are there visit the exhibit Transcending Traditions: The Next Generation and Maine Indian Basketry. You will find the work of five contemporary Maine Indian Basketmakers, Jeremy Frey, George Neptune, Ganessa Bryant, Sarah Sockbeson, and Eric "Otter" Bacon on exhibit. Also save time to visit the The Maine Indian Gallery in the museum where you will see brown ash splint and sweet grass basketry dating from 1850 to the present along with an important collection of basketmaking tools and molds, birchbark containers and implements, rootclubs, crooked knives, snowshoes, beadwork, and three full-size canoes. For more information about ash splint basketry visit BasketMakers.com for tips on Black ash as a natural basketmaking material, plant identification criteria, processing Black ash (Fraxinus nigra), suppliers, Brown ash basketmakers and much more. The Textures Basketry Calendar page for the month of November features a close up of a Black ash basket base woven by me in a Jonathan Kline workshop. The workshop was held during the 6th Biennial National Basketry Organization Conference "Tradition and Innovation in Basketry VI" - Stonehill, MA (August 2-7, 2011). The SOFA Chicago Lecture series includes an offering which should be of particular interest to basketmakers and fiber artists. 25 x 50 x 3"